Just hours after general manager David Caldwell suggested there would likely be changes coming to the defensive staff, the Jaguars have parted ways with defensive coordinator Bob Babich, writes Ryan O’Halloran of the Florida Times-Union. 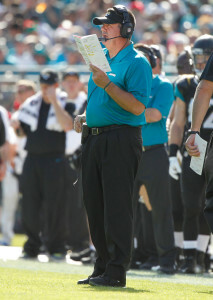 Babich, like head coach Gus Bradley, was hired by Jacksonville in January 2013. Unlike Bradley, he won’t get return to the team in 2016. While Bradley’s work as the defensive coordinator in Seattle from 2009 to 2012 contributed significantly to earning him the Jaguars’ head coaching job, he and Babich could never get Jacksonville’s defense firing on all cylinders. In each of the past three seasons, the team has ranked in the bottom 10 in the NFL in terms of points allowed and yardage allowed. The Jaguars had the opportunity to add a standout player to their defense this past year, using their third overall pick to draft Florida pass rusher Dante Fowler. However, the first-round rookie tore his ACL on the first day of mini-camp last summer and missed the entire 2015 season. Jacksonville’s next defensive coordinator will benefit from Fowler’s return, and it’s possible the Jags will use this year’s fifth overall pick on a defender as well. After seeing players like Blake Bortles and Allen Robinson enjoy breakout seasons in 2015, the team figures to focus more heavily on defensive reinforcements in the offseason.